As a premier designer and creator of fine custom engagement rings in Winnipeg, one of the top perks of our job is working directly with couples to craft their perfect engagement ring based on their tastes and style preferences. This gives us a very good look at the style trends in terms of what sorts of colours and diamond shapes are currently in and which ones are on their way out. Today we will be showing you our predictions for the top 2019 engagement engagement ring trends. Read on to learn more! Much has already been talked about with regards to rose and white gold engagement rings as this blend truly is a match made in heaven. 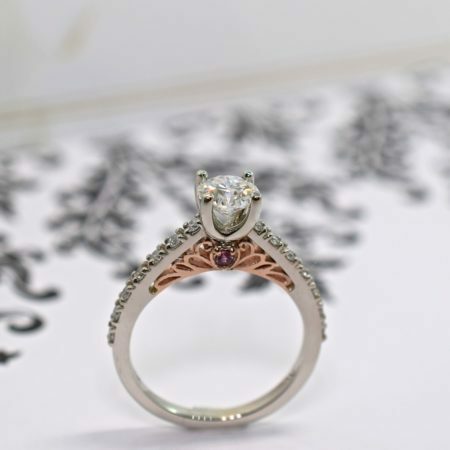 As you can see in the photo above, this winning combination allows for all sorts of creative style options, especially with regards to vintage engagement rings which often feature detailed engraving and piercing on the bridge. 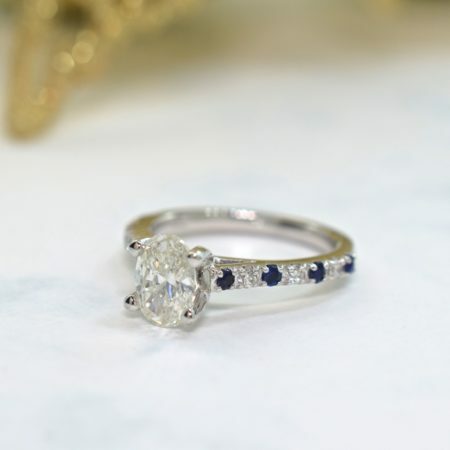 Be sure to keep an eye out for more of these designs on our instagram account as this is sure to be one of the top engagement ring trends for 2019! 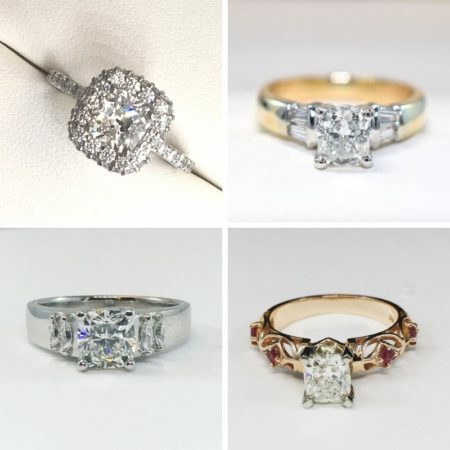 From classic solitaires to modern side stone and halo engagement ring designs, the number of requests we have had for oval diamond engagement rings has been astounding! It seems that many individuals are loving this unique yet classic diamond cut. Not only are oval cut diamonds known for their beautiful shape and elongating effect on the hand and finger, but they can also be a very good economical choice as they can appear larger for a given carat weight when compared to a round diamond. 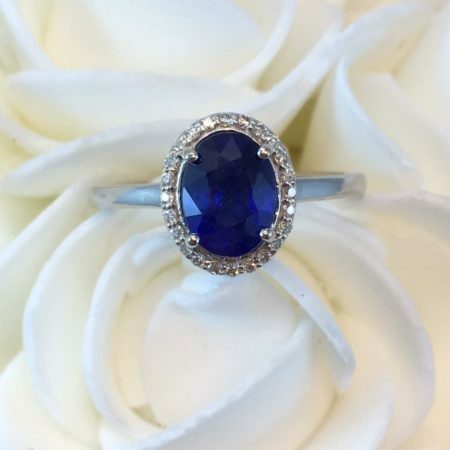 Sapphire engagement rings have been trending for the past number of years, most likely due to the vast popularity of Kate Middleton’s ring which features a beautiful blue Ceylon Sapphire which once belonged to Princess Diana. 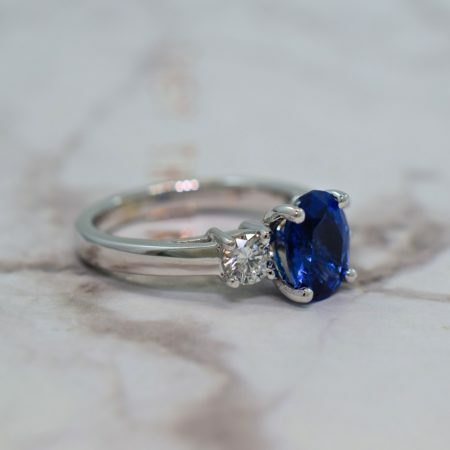 Sapphires are in fact, one of our top choices when it comes to gemstones for an engagement ring, due to their exceptional hardness and durability as they will wear very well over time. Sapphires also look great in a variety of styles from solitaires, to the more traditional and even royal designs! Although halo engagement rings have been popular for the past few years, many couples are wishing to create their halo ring in a more delicate and elegant fashion. 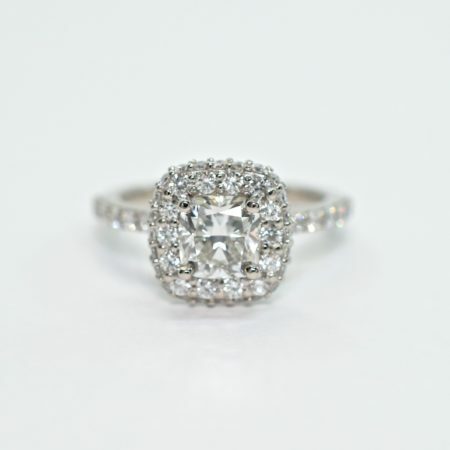 These rings often feature round or cushion cut diamonds as their centre stone. An added advantage of the diamond halo is that it accentuates the sparkle of the centre stone and allows it to appear even larger. To learn more about the above design, check out our article on this custom cushion cut engagement ring. We will definitely continue to see more delicate halo designs as one of the top 2019 engagement ring trends. Another rising trend is stacked rings which complement each other stylistically. Above is a yellow gold custom engagement ring and wedding ring set which we created. As you may notice, the rings share similar patterns in the diamond shapes used and in their detailed shapes and engraving. This creates the look of a larger single ring when worn on the hand. Many times we may even create a wedding band which fits to the shape of the engagement ring as some clients wish to have them joined together later on. 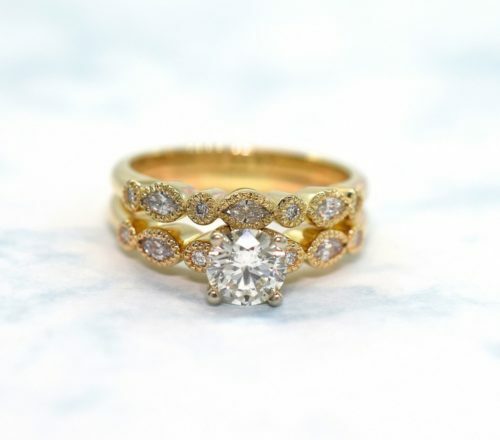 Be sure to look for more stacked and even interlocking rings as one of the top engagement ring trends of 2019. Thank you very much for taking time to read this article on the top 2019 engagement ring trends. We hope you have enjoyed learning about these new and rising engagement ring styles and perhaps gained some design inspiration for creating your own dream ring. In the mean time follow us on facebook, twitter or instagram!